When a Wal-Mart customer in Kenai places a carton of milk in their shopping cart, that milk made its way to Alaska via Lynden Transport – at least since September of this year. Thanks to innovations in equipment, customer service and value, Darigold chose Lynden Transport to move its milk and dairy products supplied to Wal-Mart and Sam’s Club stores in Anchorage, Fairbanks and Kenai. The product originates from the Darigold plant in Seattle, which is the same facility Milky Way delivers raw product to from dairy farms in Eastern Washington and other locations. According to Lynden Transport Northwest Regional Sales Manager Russ Walker, many Lynden employees were involved in securing the business, including Lee Peterson, Charlie Mottern, Jerry Wendorf, Paul Grimaldi, Mike Oliver, Alex McKallor and Jim Beck. The project required plenty of meetings and planning ahead of time. Russ went to Alaska in September with Darigold representatives to meet the Anchorage operations team of Blaine Ghan, Jered Post and Andy Collins. “The folks at Darigold were very impressed with the enthusiasm and willingness to get the job done right by the Anchorage operations staff,” he says. To move the dairy products efficiently, Lynden designed a three-axle 28-foot refrigerated trailer with the K-beam system to allow double stacking of packages. The new reefers will be capable of handling 45,000 pounds of net payload. Lynden trucks the Darigold packages to the dock in Tacoma where they are loaded onto steamship for delivery in Alaska. Lynden then completes truck delivery of the products to Sam's Club and Wal-Mart stores. In August the first test shipment to Fairbanks went off without a hitch, but the day of the actual changeover was not so smooth. 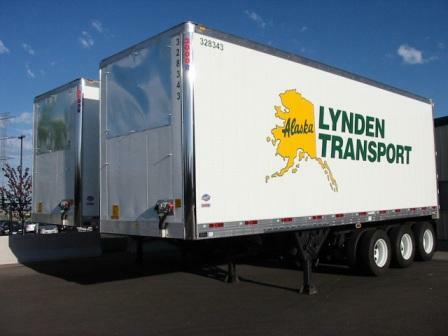 Lynden Transport will carry Darigold products to Alaska for the next five years, per the new agreement. Darigold products also move via Alaska Marine Lines barges into Juneau and Ketchikan from Seattle, and Brown Line hauls Darigold products to Costco stores in Washington and Idaho.